Hey – wanna go to the Estonian Embassy Consulate with me today? – I asked my girlfriend. I need to pick up my e-residency card. From Estonia. I applied and I have to pick it up at the consulate. No – I just have to pick it up – I’ll explain later. Fine, let’s go you freak. In my quest to do the impossible, I have a ton of things on my list that I solely want to do because it’s interesting. One of these is slowly coming to fruition as I forge my own character (think Jason Bourne meets James Bond (Sean Connery version) meets Michael Westen meets James Bond (Daniel Craig Version)) and part of that is international business and travel. So, when there’s an opportunity to expand that territory, to become more global and potentially become a global spy with great fighting skills, I jump on it. 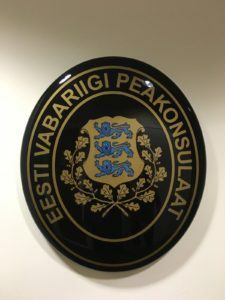 About a year ago, I found out about Estonian e-Residency – a new program put out by Estonia as part of their next-gen digital services designed to make it easy for entrepreneurs to make Estonia their home country. With an eye on the future and focused on location independence, it seemed really interesting. While it’s not quite a second passport, it is interesting, and I decided to tackle it and see what happened. But first – an important question…. WHERE THE HELL IS ESTONIA??? What Does Estonian E-Residency Get You? Contrary to what you’re probably thinking – Estonia is not a made-up country. It is real. 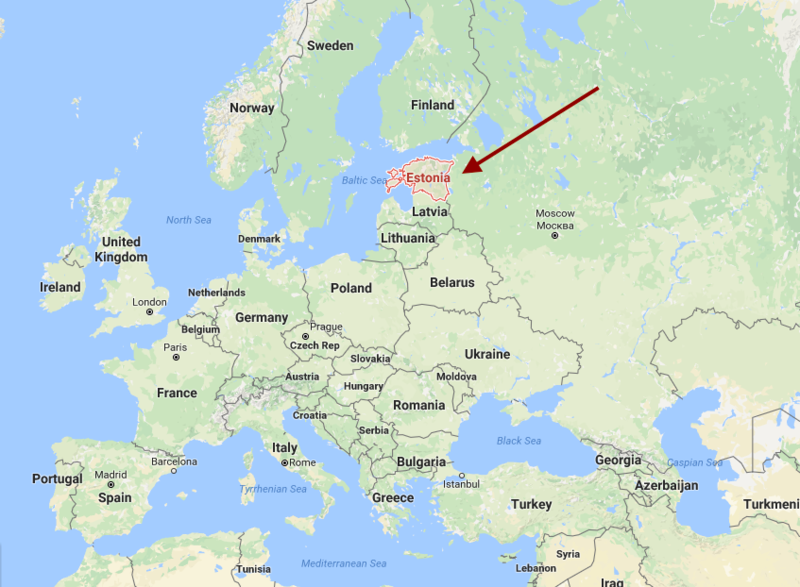 Before we jump in – Estonia is right here. It’s a Nordic / Baltic country (there’s some debate about it), but they’re located right across the Baltic Sea and Gulf of Finland from Finland – so they’re pretty close geographically if you think about the north of Europe just below Sweden / Finland. Alright – time to dive into the application process. Actually, it wasn’t ALL that bad. It was a couple pages, mostly background information. You confirm the information, pay the €100 plus €2 credit card fee, and you’re done! They run a background check and as long as you’re not a serial killer or have skeletons buried in your closet, you should be okay. By the way, they process this fast too. I applied on March 22nd. The card was ready for me to pick up at the NYC consultate on April 6th – so just over 2 weeks from application to issuing. In comparison, it takes the US typically 6 weeks to process a passport application. Unfortunately, I wasn’t able to pick up the card right away in New York because (ironically enough), I was leaving to travel around Europe for a couple months. When I came back stateside, I stopped for a day in New York and decided to finally go pick it up. I showed up and was the only one at the consulate. They buzzed me in, went back to grab my card, took a little more information to confirm it was me and fingerprinted me. They gave me my ID card, the packet, an Estonian magazine, and that was it! I was officially an Estonian e-Resident (and I’ve got the photo to prove it). So, after all that (okay, it really wasn’t that much work), what do I get out of this anyways? Multiple passports, a briefcase full of cash, multiple languages and hand-to-hand fighting skills. Plus a yacht and a helicopter. Cool deal, right? Actually – it gives me none of that. What it does do is sort of give me a digital identity within Estonia (without actually going). I actually haven’t even been to Estonia before (unless you count the Consulate, which technically is sovereign ground), so I need to put it on my travel itinerary sometime soon. Here, I can barely pay taxes in Illinois online. In Estonia, you can do almost anything – without even being in the country. For non-Americans, this is really interesting. You can start a business abroad and get a European bank account without even stepping foot on the continent. If this helps on taxes, etc really depends on your personal situation, but it makes Estonia even more attractive as the economy is becoming more and more global, and people have more access to choose where they live. They have 0% corporate tax until disbursements are made, so you can reinvest and focus on scaling your business in the country. Post-Brexit, this might even be an option for UK residents to continue to have a bank and business in the EU. It’s going to be interesting to see how useful this is for Americans. Unlike every other country in the world (except for Eritrea), we’re taxed based on our citizenship rather than on where we live or declare tax residency. So, even if I lived full time in Estonia for the rest of my life, I’d still pay US taxes unless I renounced my citizenship. While there’s been a few thousand total e-Residency cards issued, only about 800 Americans have picked one up. So why bother? I did this because it’s relatively inexpensive, was a bit of adventure and a really good learning opportunity. Also, the more I learn about Estonia, the more interesting and appealing it becomes. I definitely want to visit now and I’m seriously considering setting up an IMPOSSIBLE subsidiary in Europe and this makes this much, much easier. Just about 2 weeks of total “wait time.” If I lived in NYC, I could have picked this up back in April. The application itself took less than 30 minutes to fill out. How Many People Have Done This? Only about 800 Americans. I’m told that a few thousand cards have been issued worldwide. Update: You can see live totals of Estonia’s program here. There are currently over 12,600 who received a card. When are you going to Estonia? Great question – I hope to make it back to those countries soon (maybe during the winter to catch some northern lights). They seem to appreciate my ultra mountain man beard. Also – I know this is a bit off topic from what I usually write about. I love random, interesting challenges like this, and it falls nicely as one of the items on my impossible list. Next up – a second passport! Also, If you have any questions on the process or the actual card — let me know. Great article. Thanks for introducing our awesome e-Residency to a whole new crowd of people! You and your beard are very welcome in Estonia. Let’s hope it’ll be a cold winter so you may experience driving on the frozen sea. But still nice article, thnx. 1. I answered this in the post – I’m considering it. 2. Personally, it won’t affect my personal taxes, but if I want to have a European arm of IMPOSSIBLE, Estonia will be my first choice. Does this confer the right to actually live in Estonia? If so, does it also confer the right to live elsewhere in the EU? It makes it easier to use Estonia’s digital services (there are a lot) and presumably if you have a business in Estonia + a bank, residency is probably easier to get, but we’re still sort of waiting & seeing to see how things play out. Joel is right. E-Residency gives you access to all the online services Estonia is providing but it’s not an actual residency or citizenship. The whole idea was to give people the ability to start their businesses in Estonia and then run it remotely (through the awesome e-services) from anywhere in the world. I applied for e-residency a few months back and was approved, but then my travel plans change so my card is presumably still sitting in NY 🙁 Hopefully I’ll be able to pick it up before they give up on me. I’ll be curious to see what sort of structures people put together with this. That’s what happened with me. The card is likely wherever you told them to send it. Pickup soon. They will keep it for a max of 6 months. This is great and am looking forward for more about second passport. In the applicants by country,I did not see any African country. Is it limited to only Europe and America. Not sure – I will get the Estonian team to pop in & see if they can answer questions! It’s interesting. I just checked the application page and they have many different African countries available. I suggest you tried again. I’m actually planning on studying abroad in Estonia, so this is really cool and something I’ll definitely consider!! A lot of people signed up as they believed it would be a way to avoid tax in someway, the key benefit is being able to reinvest profits rather than give them away every year. If you have enough money to live on and don’t need to use the money or take it out then this does sound very attractive. Whether you are liable to tax or not will depend on your tax residency, of course this could change over the years and you may choose to take your money out when it is a beneficial time. This is so cool, Joel! I’m excited to see how this pans out as I’m interested in it too! Same here. Please keep us updated, Joel! Cheers for introducing the location of Estland as Northern-Europe and mentioning the ties to Sweden/Finland! If anybody is interested here’s a super-quick description of Estonia: we’re like a mini-Finland that was occupied by the Soviets in WW2 and we’re now working hard trying to gain back the lost wealth and time. Our language belongs to the Finnic language branch along with Finnish language, so there’s some mutual intelligibility between the two people. We have a beautiful Old Town that’s a UNESCO heritage site, it’s one of the best preserved medieval old towns in Europe, if anybody wants to visit the prices are still below average of Western Europe but raising fast. Our GDP per capita has passed that of Portugal and Greece, but we’re still 30% below Finland’s. Our PISA education scores are on the 11th and 6th place in the world (depending on subject like math/science, etc) and we have the lowest public/government debt per capita in Europe. Thanks for the deets Hippo! For disclaimer, I’m an Estonian living near NYC. First, thanks for sharing a good story. And I recommend anybody interested in how it works, try it out too. It’s actually pretty amazing. On the other hand, if you are able to open up a bank account without visiting our beautiful country, please let me know how did you did it? Because last time I checked, you are able to “apply” for bank account (because your identity is securely confirmed by government), but you still need physically make an appearance in one of the offices to be able to actually use it. Interesting – I was under the impression you could do it all online. I will double check & see what is possible! There’s a bit confusion regarding the possibility of opening a bank account remotely. The law that allows this was passed in June but now the banks need some more time to implement it technology wise. We really hope that it will be available in a couple of months. The remote banking will open a lot of doors for the banks in Estonia so they should accelerate the process. Remote account opening option is not available yet. It will available in Q4/2016. Sounds great – Any news about the possibility of opening a bank account remotely ? It’s supposed to be coming in the next year. Estonian Police and Border Guard Board has granted e-Residency to xxxx born on yyyy. I don’t know – if it’s being shipped from Estonia => NYC, it will be longer than 3 days. If they make it there, it’s probably just the weekend holding things up and I would relax a little bit. You compare getting a US passport to the time it takes to receive an e-residency card- but of course the US passport takes much longer- it is dealing with actual nationality / identity rather than a silly little thing like this which has nothing at all to do with being in any way, shape, or form a citizen of Estonia. A person who gets an e-resident card, to clarify, is NOT a resident of Estonia in any way. Cannot live there, vote there, or do anything there that an anyone from the US, Chile, or China can’t do without one except for signing sone documents online and theoretically running a business there (in practice, it is much more complex than that). By contrast, I have *actual* Estonian citizenship from birth as well as US citizenship, which means I can live, work, vote, hold office, etc in Estonia- I am Estonian. A person with that card is not. Just wanted to clarify that it makes a person 0.0% Estonian, so they need not worry about any responsibilities that come with being a real Estonian, like military service or paying taxes. So, that said, you have nothing to lose at all by applying even if you dont end up opening a business. Go for it. I just dont want anyone to end up disappointed when they realize they are still only actually American, English, French, etc! If you want to become a true citizen, you must live there for over half a decade, speak the language fluently enough to pass a verbal and written exam, etc….and give up your other citizenship! I compared the bureaucracy of it. I clearly state that it’s not equivalent by any means. That would be of foremost help. I appreciate the effort you put in writing this article, but I stopped at the introduction, I couldn’t after this: “WHERE THE HELL IS ESTONIA??? […] Contrary to what you’re probably thinking – Estonia is not a made-up country. It is real.”. Estonia is a well known country wtf are you talking about. I’m sorry you don’t like my free site. Here, we have a sense of humor about things. I’m still trying to figure out whether there is double taxation with the US and Estonian E Residency. For a business set up in Estonia will I also have to pay taxes in the US? Get an accountant for these questions.